Enhance your workstation by finding the healthy balance between sitting and standing with DESK-V000KL from VIVO! 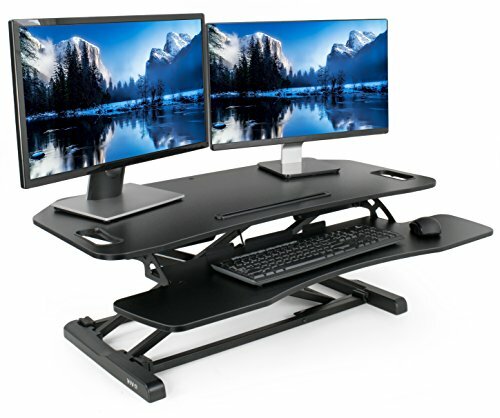 Designed to make your work experience more comfortable and ergonomic, you can transform your current desk space by adding this dual tier height adjustable workstation to your existing office desk. Featuring a durable gas spring that provides smooth transition, a height lock mechanism for perfect positioning, a large upper deck for dual monitor setups, and a preset hole for grommet installation options, this product was built to perform! All hardware is included for minimal assembly. Simply attach the keyboard tray with the included hex tool, and your desk is ready to go. Say goodbye to long days of sitting at the office, and end your work day feeling energized and refreshed! SIT TO STAND adjustable workstation allows you to find the healthy balance between sitting and standing during the long workday with a trendy, eco-friendly rising desk. QUICK TRANSITION is important for productivity and concentration, and this model achieves it with a durable gas spring lift and innovative simple touch height locking mechanism. Height adjustable range is 4 inches (resting point) to 20 inches (maximum height extension). SPACIOUS WORK AREA includes a large top surface measuring 38 x 18 inches, providing plenty of space for dual monitor/ laptop setups and important office supplies. Customize your work area to create the perfect workflow for maximum productivity. DUAL TIER design provides a 37 x 12 inch lower deck that conveniently holds your keyboard and mouse side-by-side, and raises in sync with the top surface to create a comfortable workspace. SIMPLE ASSEMBLY is your friend with all the necessary hardware and instructions provided to get your ergonomic workstation set up in no time!